Boston Ballet in Jorma Elo's 'Bach Cello Suites'. Photo by Rosalie O'Connor, courtesy of Boston Ballet. A striking thing about dance can be how some things are optical illusion, and some things are actually, physically happening with bodies in space. The mind’s eye associates movements and formations with actions and images that we know from life. At other times, we’re struck by how real – no matter how seemingly difficult – what dancers are doing can be and feel. Along with salient use of sound/music, lighting, costuming, and structure, all of this was present Boston Ballet’s three-part bill Parts in Suite. Boston Ballet in Jorma Elo’s ‘Bach Cello Suites’. Photo by Rosalie O’Connor, courtesy of Boston Ballet. Opening the night was Bach Cello Suites, a world premiere by Resident Choreographer Jorma Elo. A minimalist feel was palpable right away, with a cellist playing upstage left and one large, geometric set piece hanging above. A soloist entered, to be joined steadily by further dancers. Graceful, yet strong, partnering included motifs such as dancers skimming the floor with feet and legs, to then be lifted higher. Other movement similarly diverted from classical mandate, such as with quirky shakes and twitches. Along with this quality were low extensions and single, rather than multiple, pirouettes. Elo didn’t always push to 100 percent, making 100 percent mean more when it came. All of these choreographic choices seemed to be in service of harmony with the music; if the notes became movement, they would be what was on stage. The dancers fully embodied this metaphoric illusion, that which they also made so tangibly real. 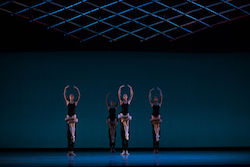 Lighting changes (by Designer John Cuff) and movement of that overhead set piece (intersecting lines of metal, scenic design by Boston Ballet Artistic Director Mikko Nissinen) also piqued my visual interest. Ballerinas wore black leotards and white tights, and danseurs wore all black. This aesthetic minimalism offered a structure for the deeper complexity in the movement to be more fully taken in and appreciated. Canon could come to feel overused, but perhaps that frequent use was an intentional reflection of the music’s repetitive, meditative feel. To end, two dancers stood perpendicularly from each other – one upstage center, the other downstage right. They looked outward, not at each other. The curtains fell. This ending could be interpreted as existentially somber – a depiction of isolation in our own consciousness. In a more hopeful take, the dancers looked into the future with courage, despite that isolation, in a spirit of rugged individualism. As in both optical illusions and reality, the perception that we bring to the interpretation can make all the difference. Lawrence Rines and Boston Ballet in Justin Peck’s ‘In Creases’. Photo by Rosalie O’Connor, courtesy of Boston Ballet. 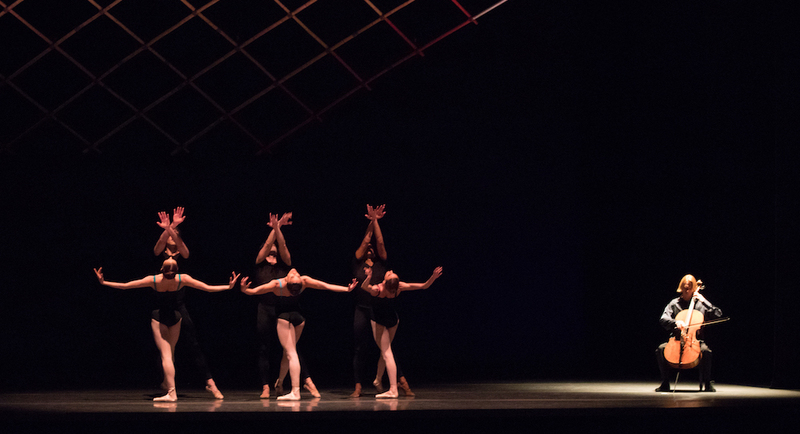 In quite a stylistic shift, the second piece – Justin Peck’s In Creases started with a true bang. Lights were bright and golden, music raced, and the dancers executed zippy choreography. In a similarity to the prior piece, two piano players at a two-sided, gargantuan piano provided a live score. There was quickly a sense of order versus chaos; clear circles dissolved into indefinable shapes, back to a circle and back to dissolving again. Jazzy movement, such as parallel turns, made its appearance. In one phrase, dancers made jazz-style L-shaped arms – accenting one part of the L extending out and then the other – while walking in deep plié, in a sloped line formation. Other phrases were more overtly classical – intersecting lines wherein ballerinas in one line jetéd through a line of danseurs, to have them take traveling petit allegro steps through the ballerinas, to have the ballerinas then sauté and tour jeté through the danseurs. Within this classical vocabulary was less conventional formation-shaping, that which created compelling visual illusions. As one, they joined hands and spinned out of a circle in a line. Simultaneously, a soloist turned solid fouetté turns, creating the illusion that her turns were causing the unraveling of the circle. As another, the same soloist was partnered to turn with one leg extended forward, dancers in a circle below her holding hands and lowering their arms to allow her leg to keep spinning without obstruction. The dancers in circle coordinated the timing of this such that it seemed that the turning dancer’s leg naturally propelled the wave-action of lowering arms in the circle, just as naturally as gravity leads an object to fall. In these aspects, the piece was most enjoyable and successful. The combination of aesthetic elements was less successful; blue and white costumes and bright lighting offered a peaceful, elegant air that was discordant with the tense, almost aggressive feel of the music and movement. Perhaps this juxtaposition was intentional, as a post-modern defiance of the need to create harmony in such elements. It seems as if Peck can also learn from much Elo about the value of sometimes holding back from full virtuosity, so that it can mean more when present. Nevertheless, the ending brought a hopeful feeling of progression forward; dancers walked off with their chins held high while gazely proudly and intently outward. John Lam Misa Kuranaga and Isaac Akiba in William Forsythe’s ‘Pas/Parts 2018’. Photo by Rosalie O’Connor, courtesy of Boston Ballet. When the curtain rose for the third piece, William Forsythe’s Pas/Parts 2018, I suddenly understood why the intermission was on the longer side. The set was a unique, impressive structure of two almost ceiling-high white walls. A solo from Chyrstyn Fentroy opened the work. She moved with an elastic quality – pliable, yet unshakably strong, and with nuanced stretching out in time of her movement. Another quickly noticeable aesthetic effect was her two-toned leotard – a different color in the back and in the front – so that there was a striking kaleidoscope effect as she turned. This effect continued throughout the piece, with every ballerina in a similarly two-toned leotard. Forsythe could have pushed this kaleidoscope effect further with more multiple turns. Yet that might have felt incongruous with the movement of the piece. Although this movement had a technical base, it is best characterized by onamonapeia: pop-pang-pow, swish-swoop-swipe! One movement flowed into the next such that the technical base became less meaningful, a means to a beautiful end. Other movement was slower and more defined, particularly (and perhaps necessarily) lifts and effects within them. In one particularly memorable lift, two danseurs lifted a ballerina under her armpits as she scissor-action opened and closed her legs, following with smaller switches of her legs, as the trio exited the staged. All of this occurred through various solos, duets, trios, ensemble sections, and various other groupings. I was heartened to see every dancer credited in the program for his/her section (though it could be quite hard to follow along in the dark theater). Another memorable moment was the entire ensemble suddenly pausing, as a center downstage soloist turned and oozed through complex footwork. The qualitative shift from the prior ensemble section, of this change from many to one dancing, was truly captivating. Also captivating was the overall futuristic feel of the work. 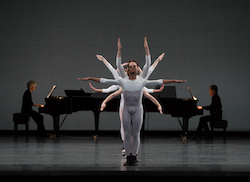 Along with that, electronic music was the piece’s score, certainly not typical in ballet. Forsythe isn’t afraid to push these boundaries. I’m so very glad that he isn’t. It’s creators like him, in every art form, who push art forward. For that matter, Elo and Peck are with him in that category. More or less successful, they’re not afraid to put forth what they have to put forth – in the artifice and the very real nature of what occurs on stage.